The Football Spin double appointment special with the great managerial bonanza as Ireland find two managers in one day. 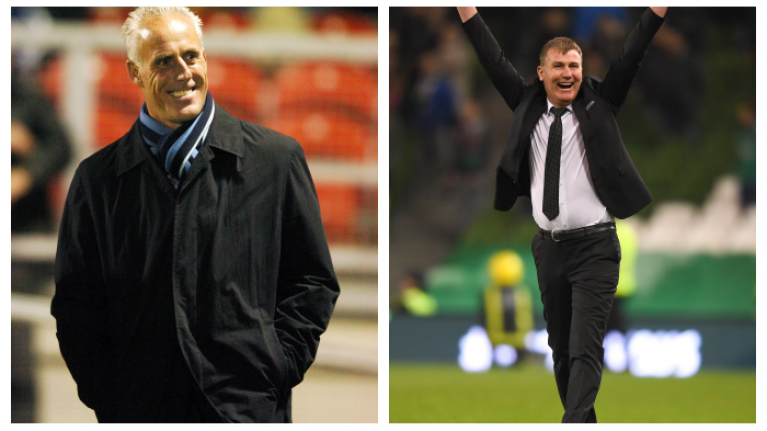 Mick McCarthy and Stephen Kenny together at last. Nobody saw this coming but on Saturday, Ireland shook off the doom and gloom and appointed two Ireland managers to take the country through the glory of European Championship success in 2020, the World Cup in Qatar in 2022 and beyond. Mick McCarthy is in and in 2020, Stephen Kenny will take over. This seemed like mindblowing ambition but in a Football Spin special, Paddy McKenna and Dion Fanning hail the wisdom of the appointment which has something for everything and makes every critic look petty and small-minded. Dion provides the details on the deal and wonders if Declan Rice could be the next bit of good news for Irish football, while Paddy is reassured that Robbie Keane still has a role to play, maybe a very big role. But is it a good day for Irish football? It's hard to see otherwise as the FAI provide a vision for the future which is exciting and bold.